When you ask students to introduce themselves in class and they share things like, "I like to make all styles of quilts...," "... I like to take classes to learn different techniques," and "... I like to step outside the box," you know you have a classroom full of adventurous quiltmakers and it's going to be a fabulously creative class! My Art Weave class yesterday was exactly this! "Art Weave" class at Sew 'n So Quilt Shop, Rocky Face, Georgia. and an assortment of fabric panels with other designs. 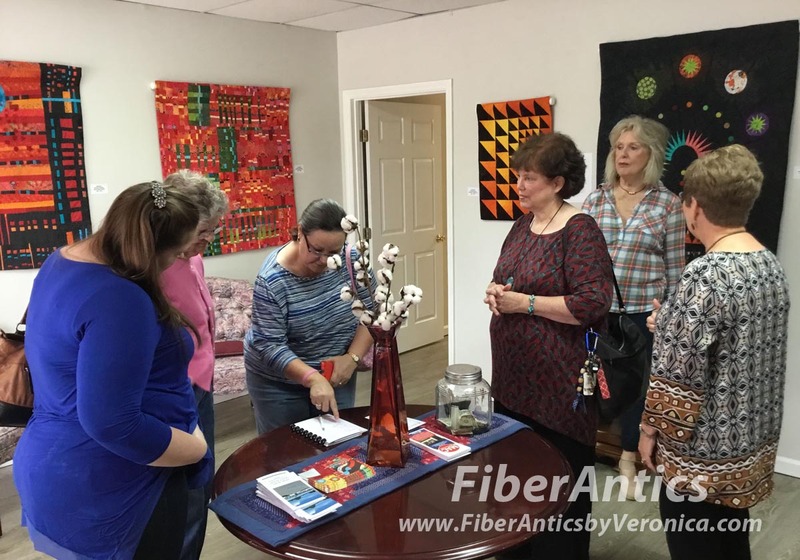 Yesterday, I taught the Art Weave technique at Sew 'n So Quilt Shop to an eager group of quiltmakers. It was a joy to be back in the classroom again. 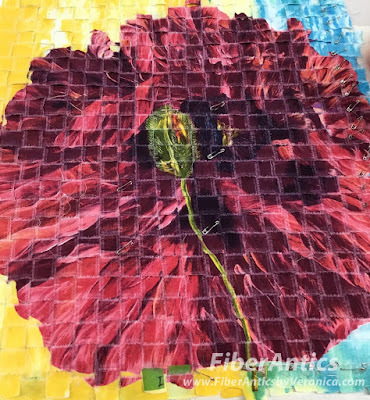 All the students created beautiful pieces of fabric art with large scale floral designs from Frond Design Studios. It was a special, serendipitous treat for me when I realized that each student had chosen a different flower design for their art weave piece. This also offered class attendees a bouquet of possibilities for what they could do for the next project. 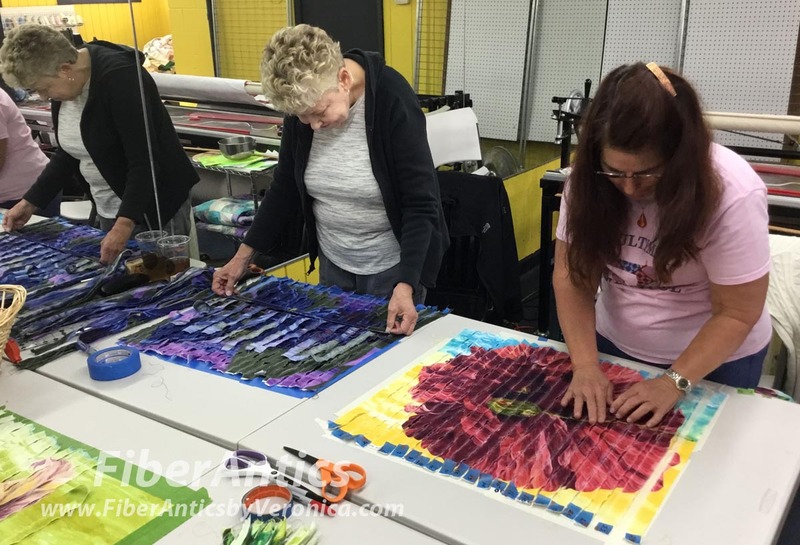 The classroom was abloom with colorful fabric art possibilities! 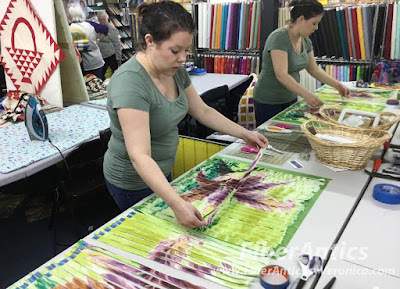 One of the missions that artist-owner, Stephanie Brandenburg, has for her fabric company, Frond Design Studios, is "Art into the every day." Frond's large scale fabric prints and the art weave technique is an ideal approach for introducing this concept to people of all skill levels. Courtney works with the Love Blossoms Lily. Stephanie also thinks of the company's fabric collections as the initial leg of a creative relay race. 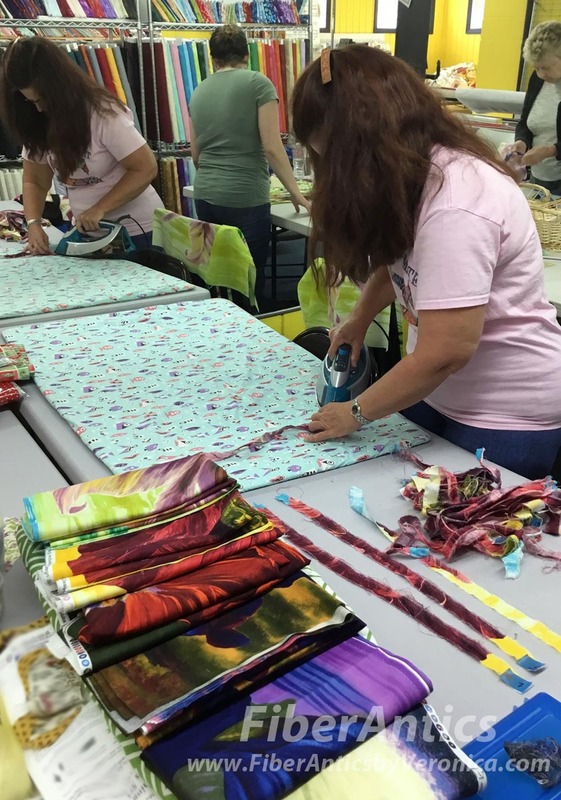 From the original paintings on canvas and the printing of the fabrics, to the merchandising, displays and class projects offered at quilt shops and independent sewing centers, to the creative hands of quilters and sewers, the baton is passed from maker to maker at each leg of a creative journey. Jo-Anne (right) chose the Love Blossoms red poppy. 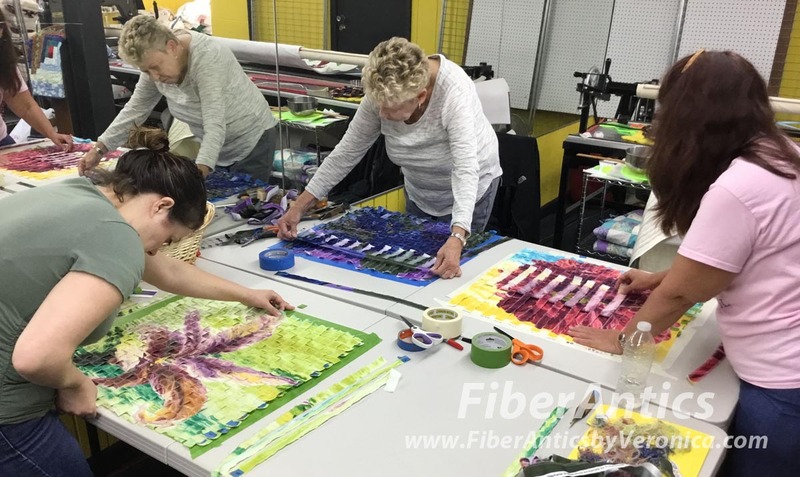 On their leg of the journey, class attendees put their individual stamp on their piece said they enjoyed the art weave technique. Here is a glimpse of their work. 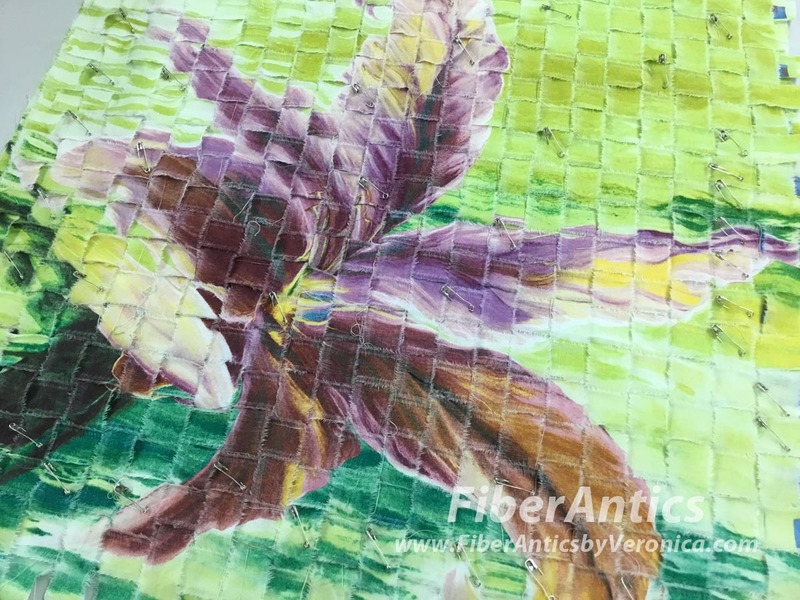 Art Weave Lily by Courtney. We discussed a variety of options for quilting and finishing and everyone chimed in with ideas for other projects using these large scale prints and fabric panels. Thank you to all my students for coming to class with a sense of adventure and to Anna at Sew 'n So for hosting the class. Art Weave Poppy by Jo-Anne. This is the violets panel from Una's Garden in one of my class samples. 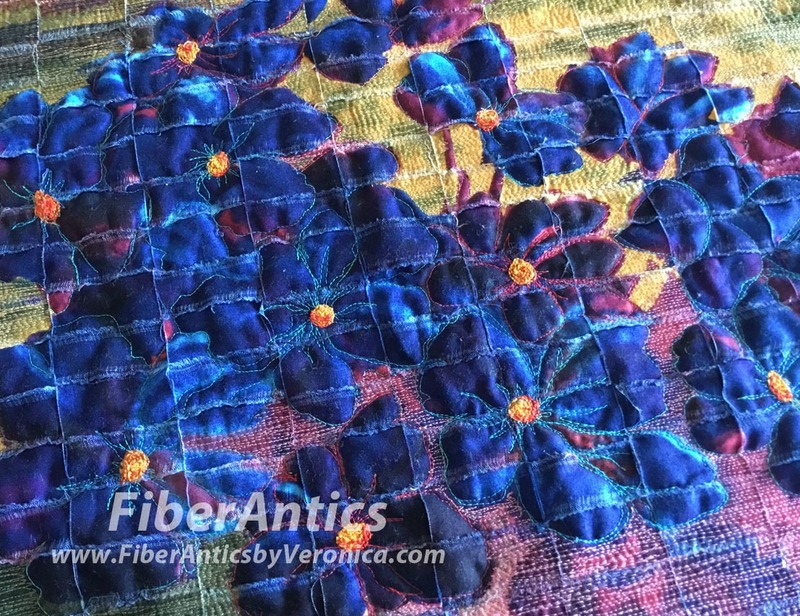 My class sample, Violet Bouquet, using the Art Weave technique. Inspired? Follow my blog and watch my class calendar to see where I will be teaching this class in the future. 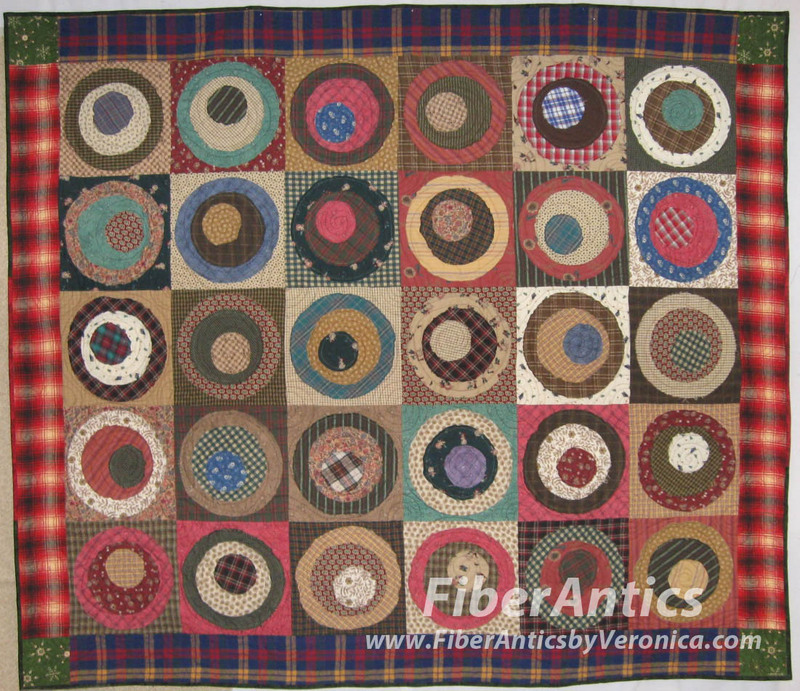 Quilt shops and quilt guilds can contact me if interested in scheduling a class. Looking for these fabrics? 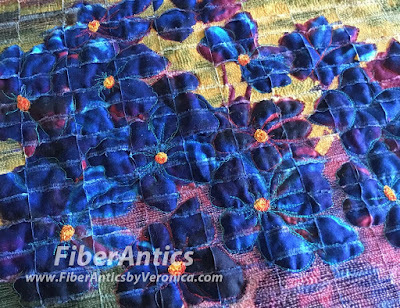 As of this blog post, Sew 'n So Quilt Shop has the full collection of the Flower Power fabric panels from Frond Design Studios. 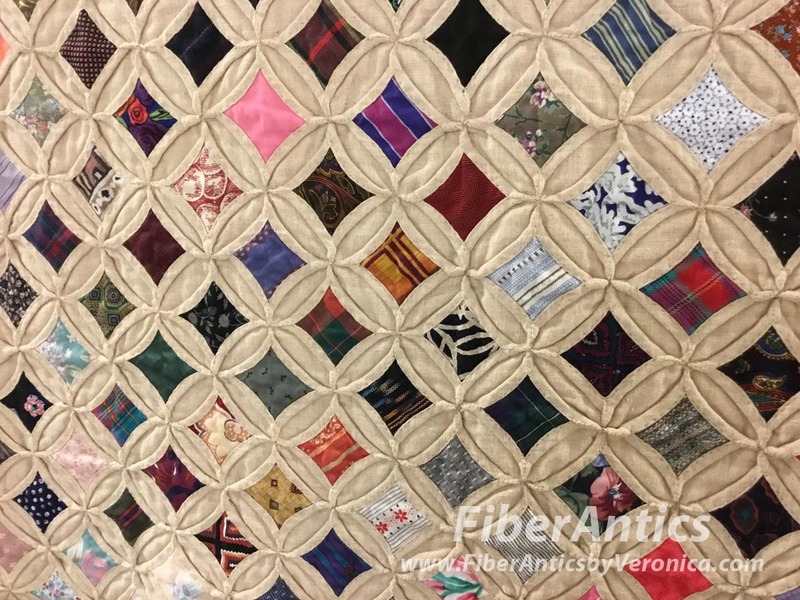 Several additional panels went home with the class attendees, so don't delay if you want some for your own quilting or sewing projects. If you are a shop owner and would like to stock these fabrics in your store, email me at fabricrepveronica (at) gmail (dot) com. I am honored to be the featured artist at a lovely exhibit of quilts and vintage sewing machines at the Murray Arts Council [MAC] in Chatsworth, Georgia. My husband, Larry, and I attended the opening reception this Saturday and were warmly greeted by the staff, volunteers and visitors to the exhibit. My quilts at the guest artist exhibit at the Murray Arts Council quilt exhibit. Nine of my quilts are on display this weekend, October 14-15, and next weekend, October 21-22 along with quilts from local quiltmakers and a wonderful selection of vintage and toy sewing machines from the collection of Debbie Vick Davenport. 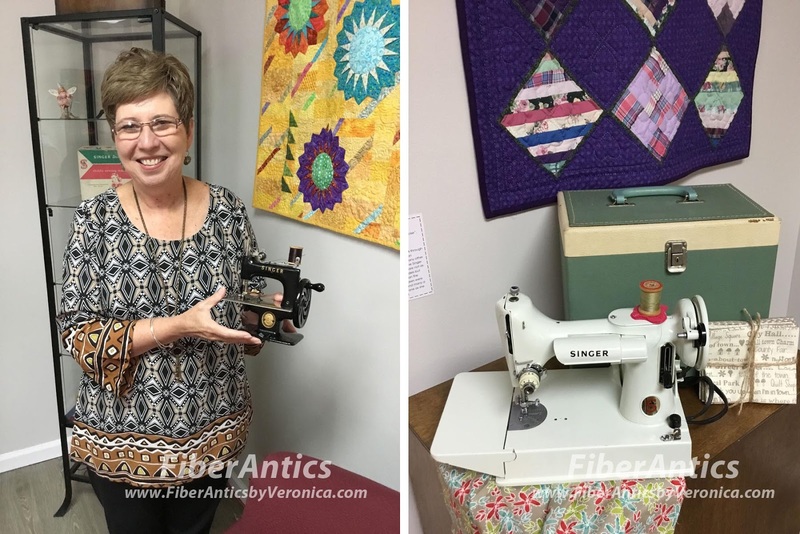 with a vintage featherweight sewing machine. 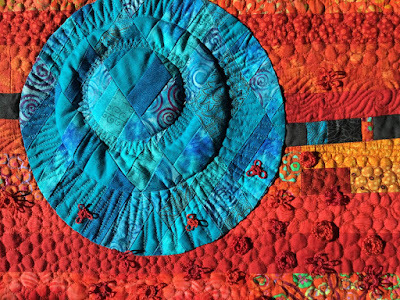 "Your art quilts set the tone for the exhibit," said Debbie Vick Davenport, my exhibit liaison and one of the exhibit's coordinators. Lori McDaniels, one of the MAC directors, indicated there was an overwhelmingly positive response to my pieces and the Guest Artist exhibit, and just the first day's visitor attendance had far exceeded past shows. 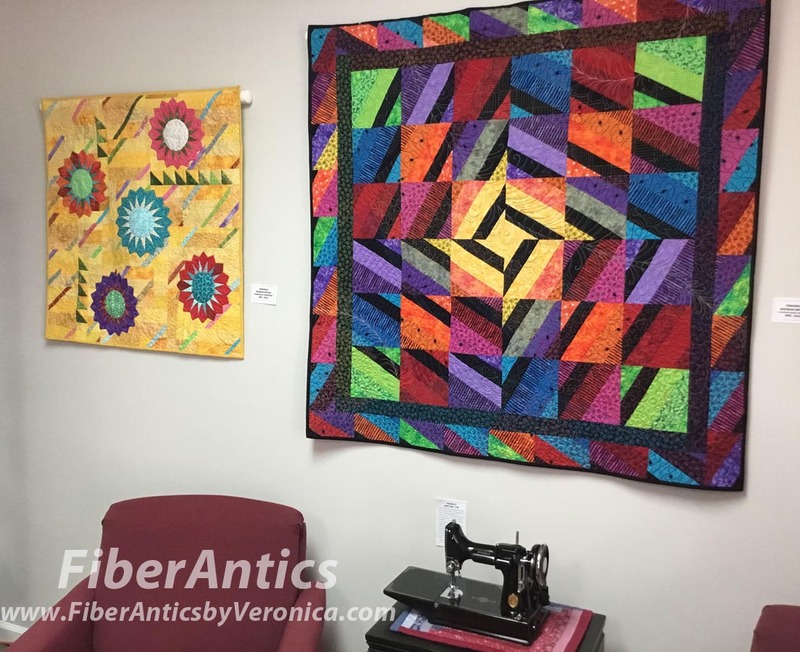 Visitors at the annual quilt exhibit at Murray Arts Council, Chatsworth, GA.
Art quilt (left) by Miriam Duncan and "Flowers for Peyton" by Brenda Bowling. 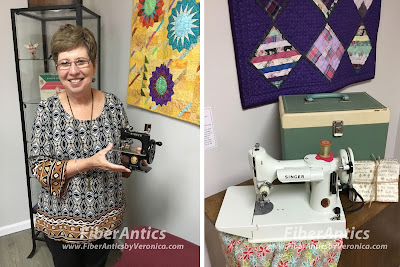 Debbie Vick Davenport with a vintage toy sewing machine. Right: a model 221K White Singer from 1964. Notice the hard carrying case. The background for this Cathedral Windows quilt is linen. 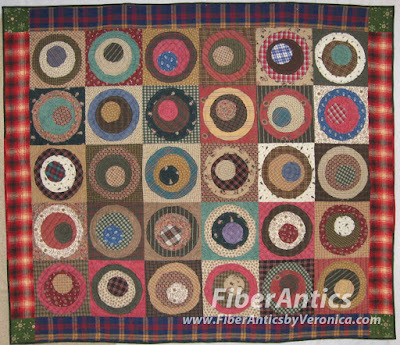 The colorful patches are fabric swatches from a mail order fabric club. 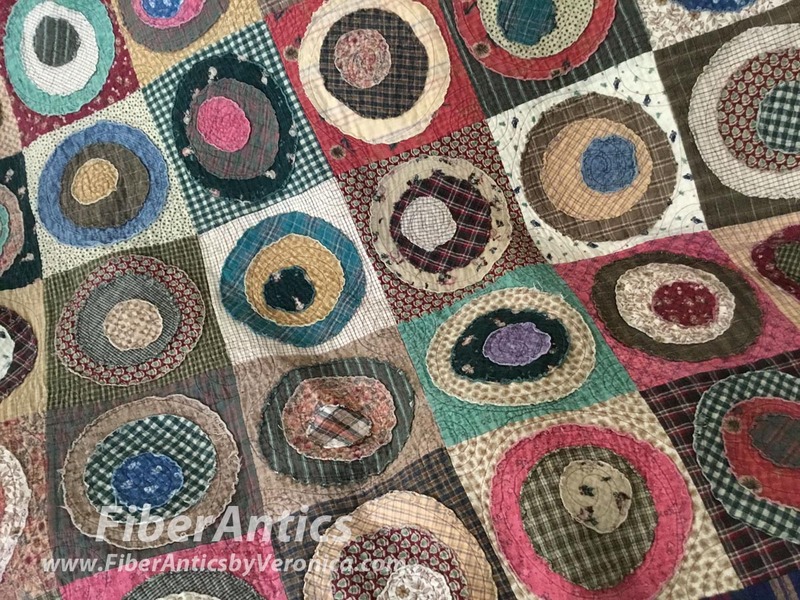 Pre-internet days, fabric stores would mail groups of fabric swatches to home sewers so they could select fabrics for mail order purchase. Cathedral Window quilt with linen and cotton fabrics. The exhibit included appliqué quilts featuring the traditional—and always recognizable—sun bonnet characters. 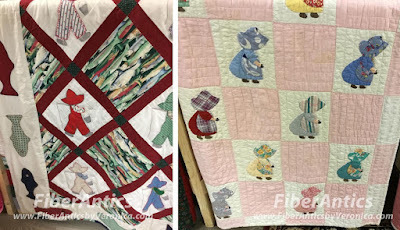 These motifs go by names such as Sunbonnet Sue, Dutch Doll, Parasol Girl and Sunbonnet Sam. I wonder if the alternate blocks of the novelty fish fabric were paired with a collection of vintage Fisherman Sam quilt blocks to make this quilt (below left). Left: Fisherman Sam with novelty fabric. Right: "Little Dutch Girls" by Mabel Beavers. One of my favorite quilts in the exhibit was this scrappy "Pinwheels and Stars" quilt by Clemmie Jones. The checks and stripes gave it an energy that spoke to me. And the mix of prints florals and other prints tells me this quiltmaker was not timid with her choice of fabrics. I think this block pattern would be fun to use in a modern quilt. 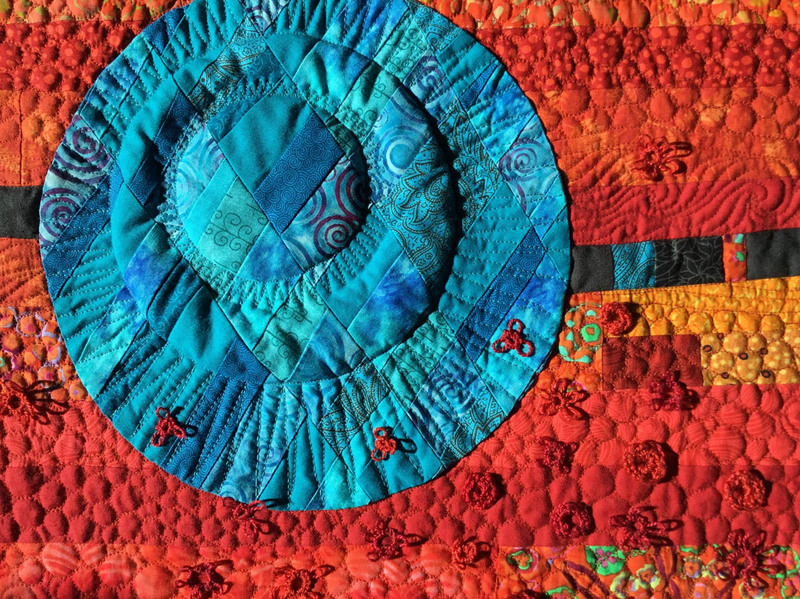 Modern quilters—what do you think? Can you envision a modern version? 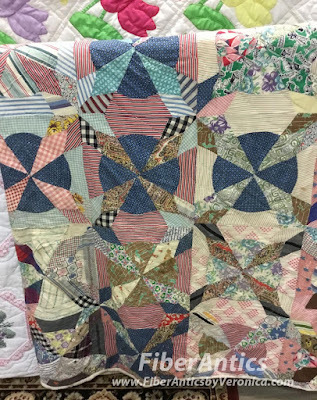 The quilt exhibit continues today (Sunday) and next weekend. If you want to make a full day of it, the Black Bear Festival is also happening October 21-22. 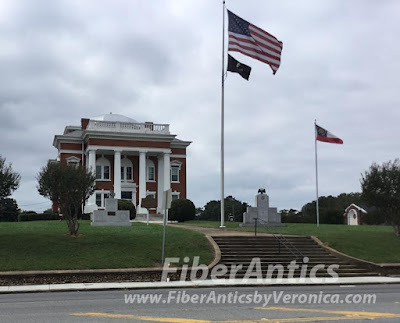 Quilts, crafts, music, food and beautiful scenery of the foothills of the Appalachians... enjoy the day! When you get to Chatsworth (if you've not been), look for the Murray County Courthouse building on N 3rd Avenue with the flags out front. The Murray County courthouse is right across from the MAC entrance. The Murray Arts Council location is in the middle of the block right across the street from the courthouse. Look for the red MAC logo on the window. 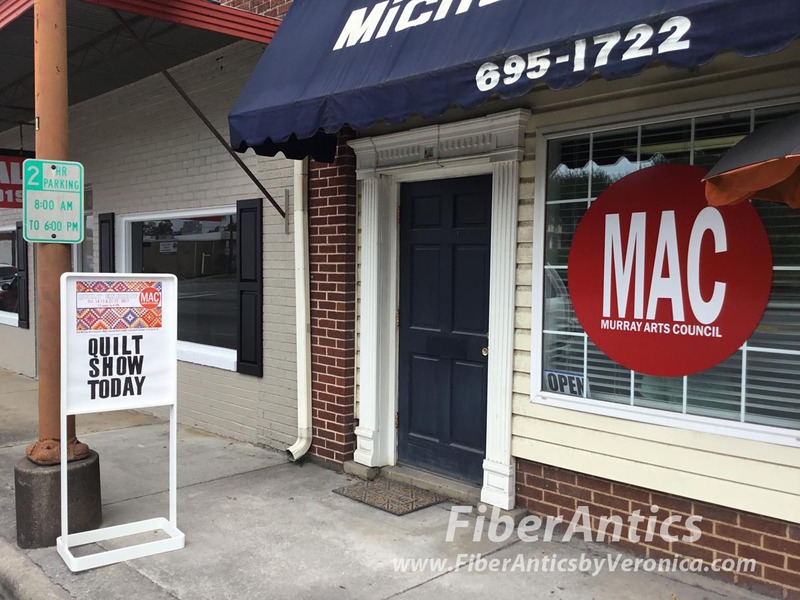 They had a "Quilt Show Today" sign outside on the sidewalk. 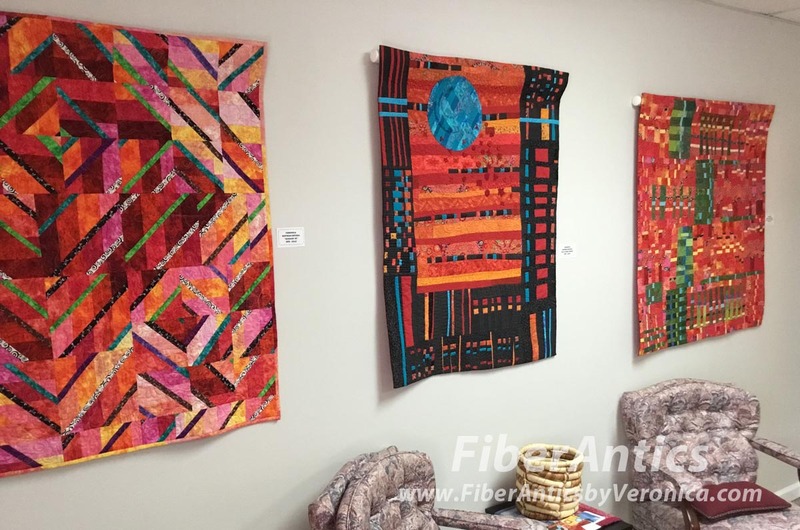 Murray County Arts Council with the quilt exhibit. At some point in the conversation between my husband and the quilt exhibit hosts, it came out that yesterday was our wedding anniversary. So, in addition to being the guest artist at the Murray Arts Council quilt exhibit, I received many compliments on my quilts and well wishes for our anniversary. Last night, we celebrated with a special anniversary dinner at Alleia downtown Chattanooga. It was a very good day. Welcome to October... and the last day of the regular baseball season. 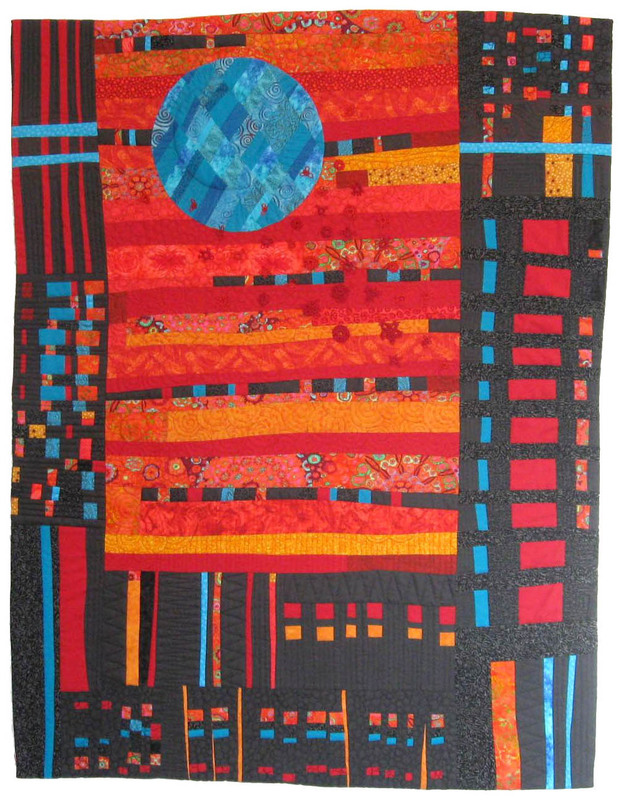 This is another quilt from the archives, called Strike Zone. 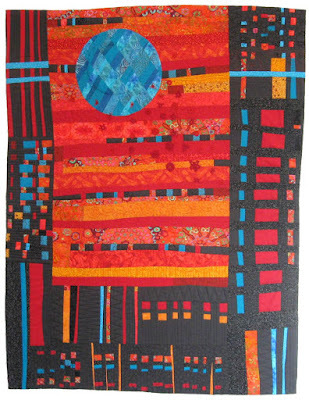 Strike Zone is a raw-edge appliqué flannel quilt I made for my husband in 2010. After 7 years of use and a number of washings (and dried in the dryer), it has held up well. baseball fantasy league participants will be checking play-by-play and end-of-game points to reveal their final ranking.